College basketball is finally back! It’s been a long summer, and there are some high expectations for some programs this year, while others are still in a rebuilding stretch. No matter where your team is, I can promise you, this is going to be another fun year in the Atlantic 10! Now that we have finally arrived at the first weekend of the season, let’s take a look at some of the top matchups on tap! This is a game that most Dukes fans have had their eye on all summer. Duquesne opens their season up ranked KenPom #171 after a season last year that I think surprised a lot of people. William & Mary, meanwhile, open at KenPom #127, after being picked 4th in the CAA this season. 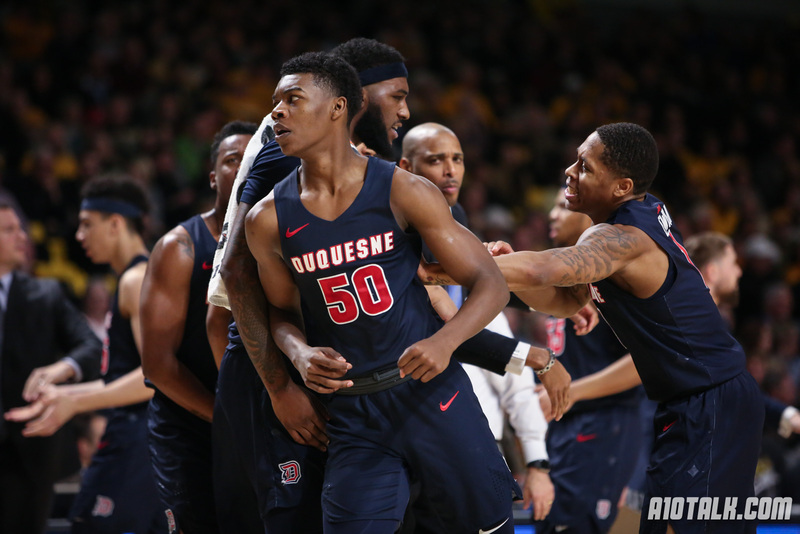 An interesting dynamic to this game is this will be the season opener for Duquesne will have the virtue of having already faced High Point on Wednesday, providing a chance to shake off some rust. Additionally, this will be a nice preview for George Mason and Saint Joseph’s, who will faced the Tribe later this season. This game may not look that intriguing at first glance, but this has to the potential to turn into a solid tune-up win for the Billikens, who enter this game with a 1-0 record after posting an opening night victory over SEMO. Troy also comes into this matchup 1-0, after blowing out Division II Fort Valley State 95-60 on Tuesday. The Trojans enter Saturday ranked #165 by KenPom, which, while not exactly stellar, is still pretty solid for a mid-major. This is the type of game Saint Louis absolutely needs to win if they are to make a case for themselves in the eye of the NCAA Tournament Selection Committee. Especially, after they struggled to put away SEMO, who entered that game KenPom #306. This game is not likely to be that much of a contest, but I throw it in here simply because the opportunity for a huge win for the A-10 is there. UVA opened their 2019 campaign with a 73-42 win over Towson on Tuesday night. GW on the other hand, is coming off two embarrassing home loses to Stony Brook and Siena to start the season. It will take a miracle and then some for GW to pull off this upset- hey any chance we could get UMBC to suit up instead? As the regular season gets underway, so too does the early-season tournaments. Davidson will get a chance for a couple of early résumé boosting wins in the Charleston Classic against Wichita State on Thursday before a potential showdown with #24 Purdue (or Appalachian State). Both UMass (Tuesday) and Rhode Island (Friday) will get a shot to play Harvard at home, while La Salle will travel to the swamp to face Florida on Wednesday. Additionally, Saint Joseph’s will open the Myrtle Beach Invitational against Wake Forest on Thursday before a potential showdown with AAC-favorite UCF (or Cal State Fullerton) on Friday.